Cait Williamson, a graduate student at Columbia University, understands the importance of being a well-rounded student. Throughout her schooling, this same theme emerges- trying something different helped her identify her passions. During her high school years in California, she took numerous classes including math, history, literature, physics and biology to discover her talent and love for the biological sciences. Cait tested her tolerance for a different climate and culture by traveling across the country to attend undergrad in New York at Columbia University. At college, Cait was planning on majoring in Biology on a pre-med track until she took a psychology class and decided to major in Neuroscience and Behavior. However, it wasn’t until getting experience in both a lab and volunteering at a hospital that she realized she wanted to be a scientist. Thinking creatively to solve interesting problems that affect society was the path she was truly interested in pursuing. Cait loves the variety and opportunities to try new things in graduate school as well. 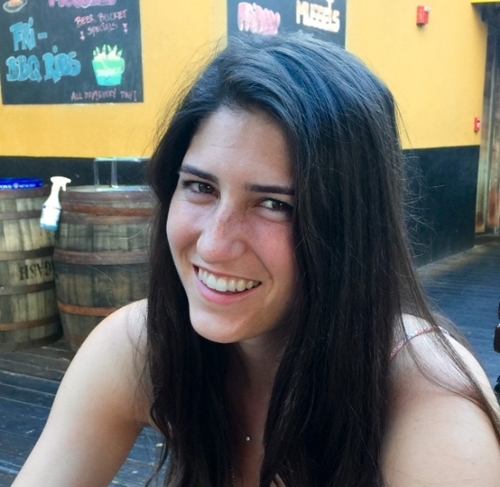 In Cait’s research in the Curley lab, where she studies what happens behaviorally and biologically in the brain when a social network is changed, she uses a variety of methods to understand behavioral, social and biological questions in a creative way! But Cait doesn’t spend all of her time in lab and she recommends to find other fun things to do to help unwind! In fact, in her free time she runs marathons and is currently training for her fourth! Go Cait! Her well-balanced approach to training so far is one she recommends for young students- get diverse set of experiences and try lots of new things to decide what you might be interested in doing! And even if you are late in your high school or college experience with no idea what to do next, she stresses not to panic because everything will work out in the end! Cait is following her own advice when trying to determine what she wants to do for a career. She is keeping the door open for several potential careers including teaching (which she loves) or maybe even data analytics, consulting, or working for a private company. Her story is just one of many other examples of people being open to new opportunities as they present themselves. We’re glad she is a part of the Open Labs team where she gets to share all of her experience and advice with the next generation of scientists! If you have any questions for Cait, other members of the Open Labs team, or if you want more information on how to attend or get involved with upcoming events, contact us at openlabsfellowship@gmail.com. Also, be sure to follow us on Facebook, Twitter, and Instagram for latest Open Labs and science updates!